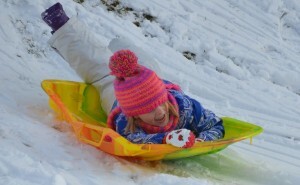 This winter seems to be an especially cold one without a lot of snow, a big disappointment to my girls. My oldest, Katherine, has been exasperated with Father Winter and has called him out on his job performance. She also likes to point out what a mistake it was to move from Sun Valley, Idaho where we would get tons of snow to a place that is so brown during the winter. I personally am enjoying the lack of white stuff, as it means I don’t need to worry about removing it from my car or traipsing through it as I walk our beagle, Charlie Bucket. Though the frigid temps aren’t very welcome. It makes it tough for the girls to get outside and burn off some of their energy and hopefully diffuse any quarrels that are lying below the surface. There have been an unusually high frequency of sisterly spats this winter, and I am ready to hang up my referee whistle. It has been great when we have had a decent snow fall. I can send the girls out into the backyard where they spend an hour or two sledding and creating snow art. It inevitably ends when one gets mad at the other. I have had to handle moments of Katherine pulling Sophie off the sled by her scarf and Sophie repeatedly running her sled into the snowman Katherine is sculpting. I don’t tell them, but sometimes I like to sit in front of the dining room window and watch this all unfold. The only thing missing in these moments is the popcorn to enjoy while I watch the skirmishes that occur. I tell myself it is good to step back and not run to intervene and solve the problems. I admit, it also is a bit of much-needed entertainment for me. On weekends and on snow days from school, I try to be prepared and channel my inner Martha Stewart for the moments when Sophie no longer wants to be coloring or play with Barbie, and Katherine doesn’t want to read. I sift through Pinterest and check out Facebook to see if anyone has done anything fun that I can use. This past weekend I decided to finally try a craft I found online, using old crayons to basically make new ones. We spent a few hours unwrapping the crayons and breaking them apart to fit into the molds. I was impressed with how focused we all were on the project and the girls were ecstatic with the end result. 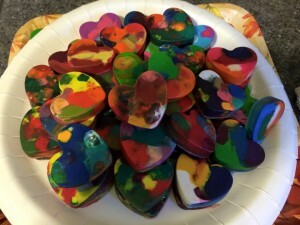 We have dozens of heart shaped crayons (below) that the girls are going to hand out during their Valentine Day parties. I felt quite accomplished after that crafting moment. Snow days can be a bit tougher for me to handle. I work from home and, even though it is a flexible job, I tend to have my days mapped out with what I am going to do. These days are great for the girls to bring out crafty gifts they got for Christmas, or I can bribe Katherine to play a board game with Sophie. It seems like they are only entertained with such activities for the briefest of time before I start hearing, “What can we do now?” and “I’m bored.” I usually end up getting half the work done and waiting to do the rest when they are in bed for the night. 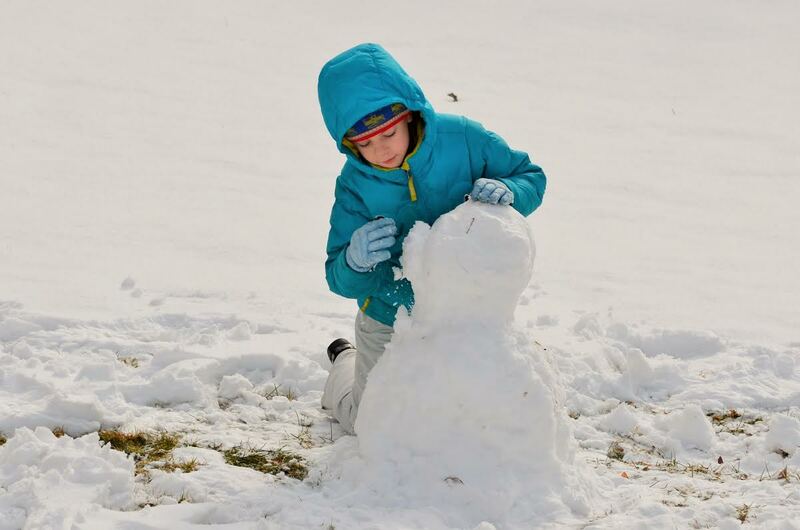 I marvel at the parents who say they love snow days. I have to wonder what magic they are weaving. Maybe they are just more strategic and have a fail-proof plan in place that gets them through the day with minimal or no sibling spats. I would like to be clued in on this bit of knowledge. I would like it a lot. At this point, I think my girls are getting to where I am with barely being able to tolerate winter anymore. The other day I caught Sophie packing her suitcase. I wasn’t going to say anything at first, but I was really curious to see what she was planning. I was informed that she was packing for our beach vacation, the one I hadn’t made any plans for. I told her summer was still a few months away. That response got me “the look” and a disgruntled “Mama.” I let it go and, at this point the suitcase remains packed with some of her most prized possessions under her bed awaiting a beach vacation. Yesterday, Katherine made it very clear that the groundhog better not see its shadow on Monday. I hope for the Punxsutawney Phil’s sake he doesn’t. I would advise not to get her started on snow day discussions either. The last snow day that was called when there wasn’t any snow on the ground (though weather forecasts were claiming lots was on the way) left her spewing for 15 minutes about how it can’t be called a “snow day” when there wasn’t even any snow around. I have moments where I reminisce about being in Sun Valley and I think how much easier it would be to get through the winter out there. When we got snow, and there was a lot of it, it stuck around all winter. There was so much we could do from skiing to sledding to tubing to playing hockey to snowshoeing. The options seemed endless. It was great. The best part, the sun was always shining throughout the winter. It never seemed dreary out there. I catch myself thinking how easy it would be to occupy the girls’ time. But, we are here, and I just have to get a bit creative to keep them busy. I think it is safe to say that I am ready for spring, and I think the girls are too. I am pretty confident that, if the cold weather continues for much longer, the skirmishes between the girls will begin to look a lot like battle scenes from Braveheart. Though I do admit that could be entertaining. I tell myself frequently that there have to be other mothers out there going through similar moments, and that seems to help…a little.